Nantettatte!! 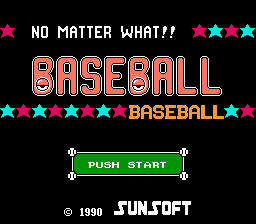 Baseball is a baseball game for the Nintendo Entertainment System. In No Matter What!! 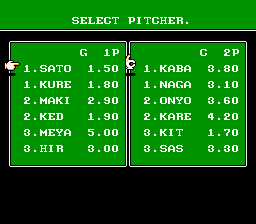 Baseball you control one of 16 cartoon-styled teams and try to lead them on to victory. 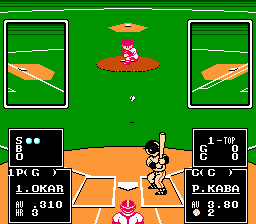 The gameplay is simple and similar to many other baseball games released on the NES, with five ways to play. You can play a versus mode against either the computer or a partner, take a team through a season of between 30 and 130 games in hopes of winning the pennant, play a multiplayer tournament, or play a home run derby and try to knock as many balls as you can out of the park. There’s also an edit mode where you can configure your team for the Pennant Mode, and a “Watch” mode where you can watch a CPU-controlled match. Each of the sixteen teams, just like actual baseball teams, have strengths and weaknesses. Seven of the teams also have designated hitters, who replace pitchers when it’s their turn at bat. All teams also have eight starters, who can be switched out at any point (but cannot be switched back). 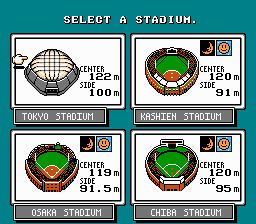 The teams can play in either one of four stadiums, which all are basically the same. Enjoy!